Horse racing and whiskey cocktails go hand-in-hand. Every race has their own official cocktail and they almost always include bourbon. The third leg of horse racing's Triple Crown, the Belmont Stakes has had a number of 'official' drinks and this Belmont Jewel is one of them (more on that below the recipe). This particular recipe features the smooth flavor of Woodford Reserve. The drink is simple and delicious. 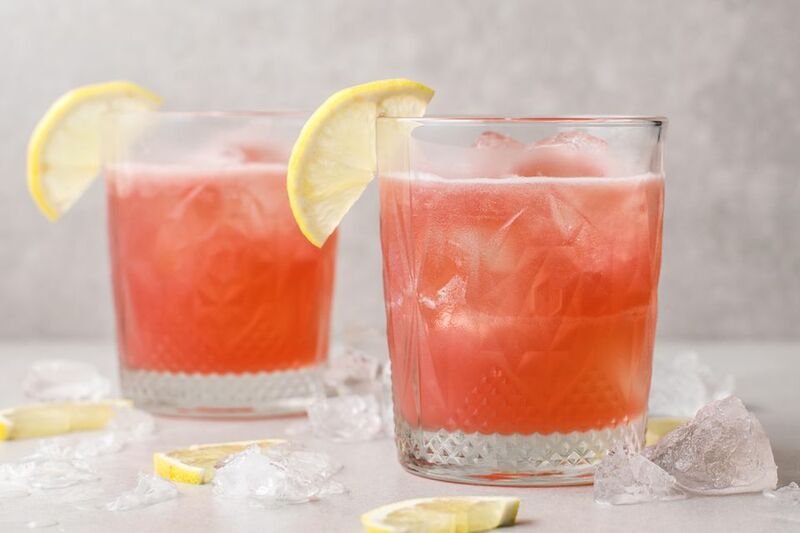 It is a mix of bourbon whiskey with lemonade and pomegranate juice and it is perfect for any occasion with uses far beyond the June race. It is also an easy recipe to transform into a punch and serve by the pitcher-full to a thirsty crowd. Strain over ice into a double old-fashioned glass. Garnish with a lemon wedge or cherry. It is funny to look at the many incarnations of 'official' cocktails surrounding the Triple Crown races. Among the three, the Kentucky Derby is the only race that has stuck with a single drink over the years and though the bourbon of choice has changed with sponsorships, the Mint Julep has remained the drink to have while watching the Derby. With that said, there is a new "official" recipe released every year and they're quite interesting. This is not the case for the other two races. The 'official' cocktails change regularly and, oddly enough, they often keep the same name. We have seen it with the Black-Eyed Susan and the Preakness Stakes and the same can be said of the Belmont. The Woodford Reserve Belmont Jewel above was published in 2011. Prior to that, Dale DeGroff created the Belmont Breeze for the race in 1998, which replaced the long-standing favorite called the White Carnation. I'm sure that there have been other official drinks that I've missed over the years, but the recipe of 2015 (according to the Belmont Stakes website) was the exact recipe listed above with pomegranate and lemonade, only the bourbon is different. Knob Creek (a Jim Beam brand) was the official bourbon of the Belmont Stakes and is used to make the Belmont Jewel for a couple years. In 2017, Woodford returns and the drink remains the same. All of this is simply a marketing and sponsorship game that we see play out in every professional sport and it is likely to change once again. Either Woodford Reserve or Knob Creek make a great Belmont Jewel though they are two completely different bourbons. If you want a strong bourbon flavor, go with Knob Creek. If something a little softer and more subtle is more your style, choose Woodford Reserve. How Strong Is the Belmont Jewel? The strength of the Belmont Jewel is going to depend completely on the bourbon you decide to go with. The difference is minimal though the comparison is interesting. When made with the 43.2 percent ABV Woodford Reserve, the finished cocktail would be about 13 percent ABV (26 proof). If opting for the stronger Knob Creek (50 percent ABV), then the drink is a little stronger at right around 15 percent ABV (30 proof).